What’s Wrong (Or Right) With This Picture? Imperial/New Yorker (post-Imperial) front clip? It’s either that or there is something non-standard about the side paneling. +1 on the front clip. T&C wagons didn’t share in the Imperialization of their New Yorker brethren. Can’t make out that script, looks like Imperial Town and Country? What’s wrong? A smog control-choked engine and fuel use measured in gallons per mile. Other than that? Not a thing! I’d think a sunroof is quite rare, indeed. It’s missing Aunt Edna on the roof. The car represents a diagonal. For ideal composition the diagonal should run from bottom left to top right. If you reversed the picture it would be great. It may not be factory, but there’s nothing wrong with it. I love it! Palm trees. I hate palm trees. That wood looks like it is much lighter in color than I remember seeing on those types of cars but I love the whole thing. Abso-damned-lutely Nothing! OK, Lean Burn. But that is fixable. I always wondered why the T&C did not get the New Yorker front clip in 1976. After all, it had one in 1974-75, but then when that front end was downgraded to the Newport Custom, it stayed on the wagon. Actually, this is the one bodystyle that looks better as a fuselage than in the 74-76 high-end Chrysler. But this is the best looking one of these I have ever seen. They’re not bad, but my preference would be a downsized Pontiac Grand Safari with factory Rallye IIs. With you there, Dan. I have never understood why anyone thinks wire wheels look good on big American cruisers. In their natural habitat, such as 1934 Packard LeBaron speedsters, they fit well. I really like the look of wire caps. Had them on my beloved 76 Royal Monaco for a while. What a pain in the neck to keep clean. After a couple of years, I went back to the stock full wheel covers. Never looked back. Will never have wires again. It’s not a case of anyone “copying” per se it’s just that was the cheap styled steel wheel that Kelsey-Hayes made and sold to everybody. IH used them too, I’ve got them on my Scouts and Travelall. As mentioned above, no hideways from the factory. Looks good probably not a factory edition but a good wagon all the same. 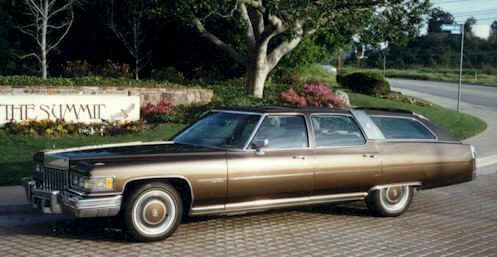 I think to get the ‘New Yorker Brougham’ look correct, it should be a hardtop wagon, like the early ’60s New Yorker wagons. Its Grizwoldtastic! Looks really Good and I like the light colored woodgrain vinyl. I had a 76 Cordoba with the same wheels,they looked great! 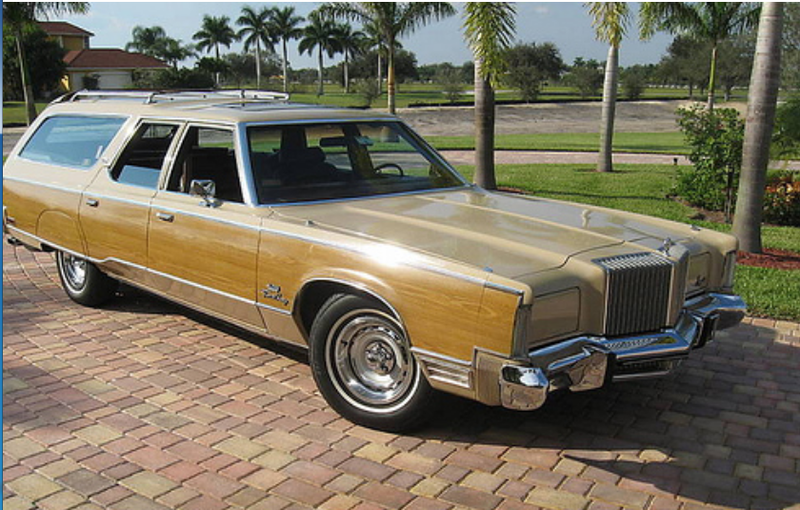 always thought they were the same style used on AMC ‘X’ models…..
I’m impressed that the guy took the time to rework the woodgrain trim to adapt to the Imperial clip. It’s a lighter (and more attractive) color than what came from the factory, so I assume it was redone when the swap was performed. What’s wrong? The rear window does not roll all the way down? It’s a beauty though…cross country trek mobile, if ever. That would have been the ammo ChryCo needed to battle the LTD had they done it. That’s an attractive package. Thanks to someone for deleting the duplicate post. Edit, WP, and Mobile don’t work well. It’s not a 67 Country Squire or a 68 Colony Park, other than that shortcoming it is gorgeous. Love the look of this, I think maybe I’ve seen it done on another T&C. I’d like to see an older “fuselage” T&C with the frond end of a 1970 300. I always thought the hidden-headlight grille was the best feature of my mom’s ’70 Sport Suburban. I swear I’ve seen a Chrysler wagon of this vintage with the Imperial grill before– I think it was in Motor Trend back when this car would have been new. Maybe I’m getting senile! If you ask me, what’s wrong with this picture is that the car is so big, you couldn’t get all of it in the shot. In ’76, when the New Yorker was awarded the 74/75 Imperial’s (R.I.P.) wardrobe, the T&C was left to continue wearing the 74/75 New Yorker clothes. It is very easy to put the Imp based front clip onto a T&C and I have seen it done many times. A couple of them have been on ebay. In fact, if your T&C was in a front-ender, it was easier to locate the fancier front end to do the repair. ‘Lean-burn’ is not a problem with this wagon. I remember seeing it listed for sale on E-bay a few years ago. The 440 has been fitted with a custom electronic fuel injection system.